The fast, easy way to clean gold, diamonds, and other gemstones -- even pieces with intricate details. Brings jewelry back to its original sparkle in seconds. 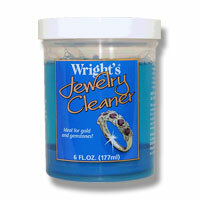 Cleans gold and a variety of gemstones. Brings jewelry back to its original sparkle in seconds. For all types of fine jewelry, from wedding bands to precious gems.